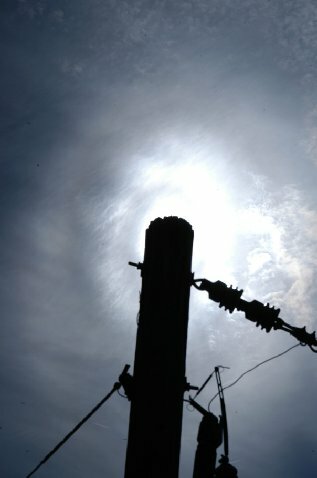 Starting from the 1970's we have seen numerous photos of subparhelic circle opposite to the sun and it is a little wonder that sub-120° parhelion has never been observed from an airplane. 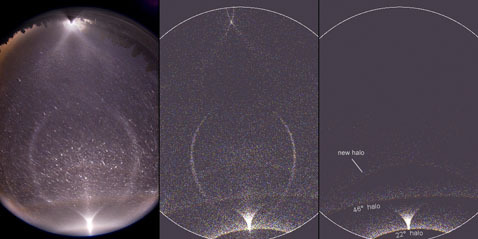 Even the sub-Liljequist parhelion, of which formation is sensitive to crystal shape deviations from regular hexagon, and which from that point of view should be rarer than sub-120° parhelion, has been photographed a couple of times. Well, given enough time, things are bound to change. 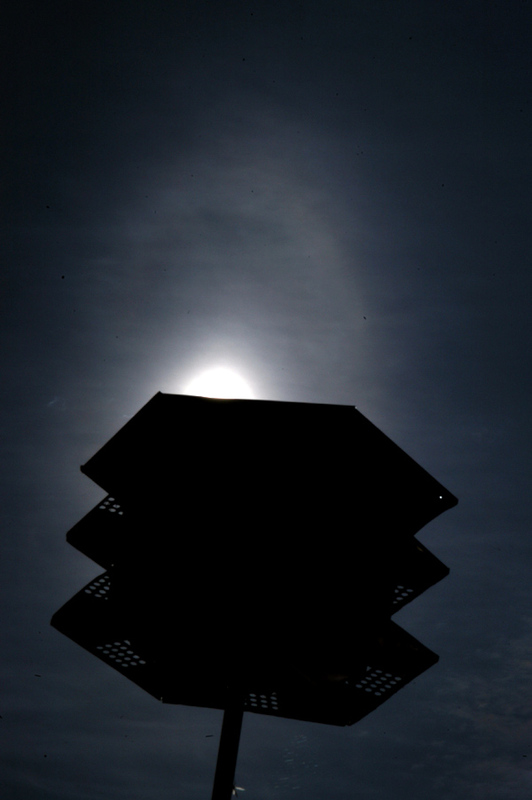 On 31 July this year sub-120° parhelion was finally photographed. 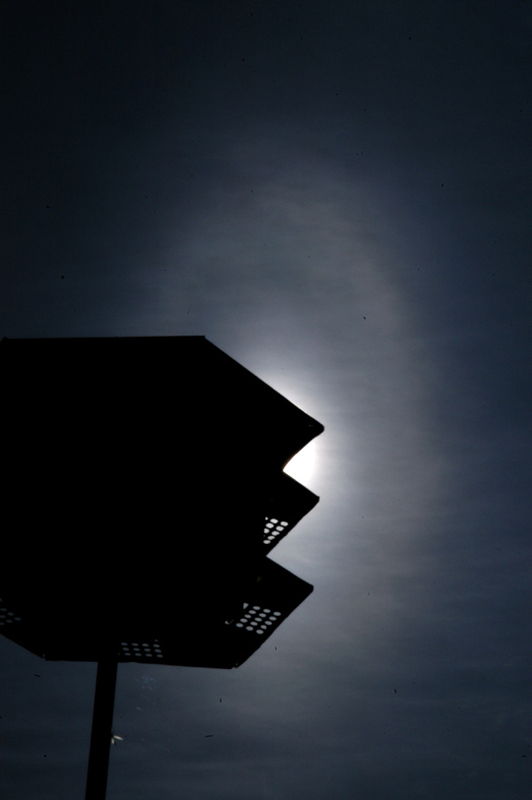 The man behind the camera, Tomas Trzicky, was on a return trip from watching a total sun eclipse in China. The halo display appeared on the last stretch of this trip, on its last hour, when the airplane started descending to Prague. "I was really lucky - actually I was sitting in the isle during most of the flight, one member of our observing group left her window seat for a while, so I more or less routinely checked the white haze outside - and there it was :-)", tells Tomas. The sub-120° parhelion was captured on two photos, click on the image above to see them. To the left from the halo is a patch of subparhelic circle, which most probably is sub-Liljequist parhelion. 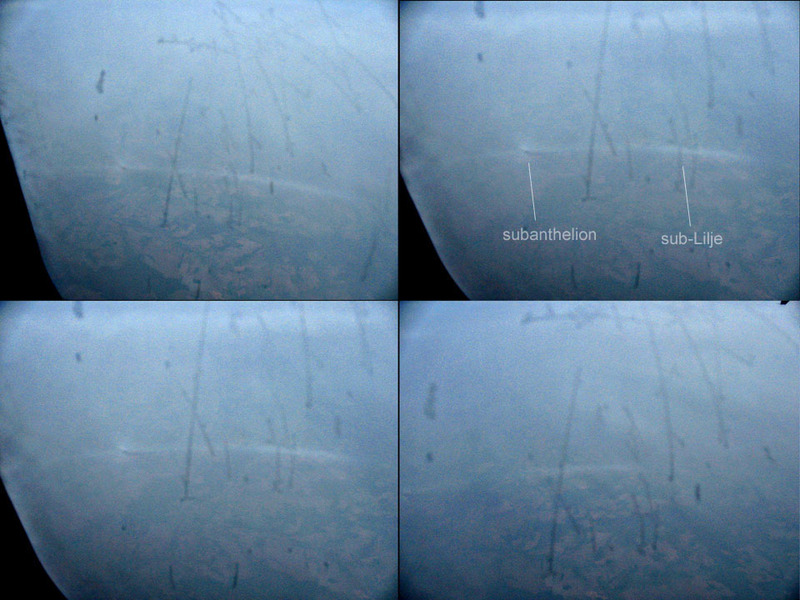 Further left, in other photos, subanthelion and faint diffuse anthelic arcs crossing it are also visible ( 1 ). 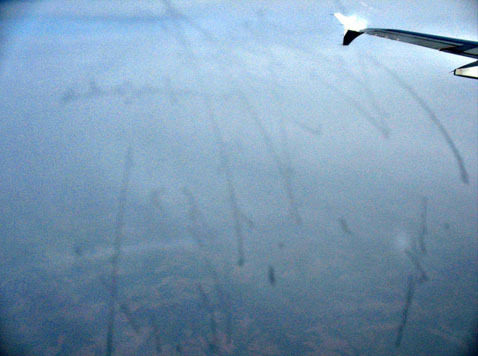 The window was dirty and it was frosty, but it just adds to the magic of discovery. 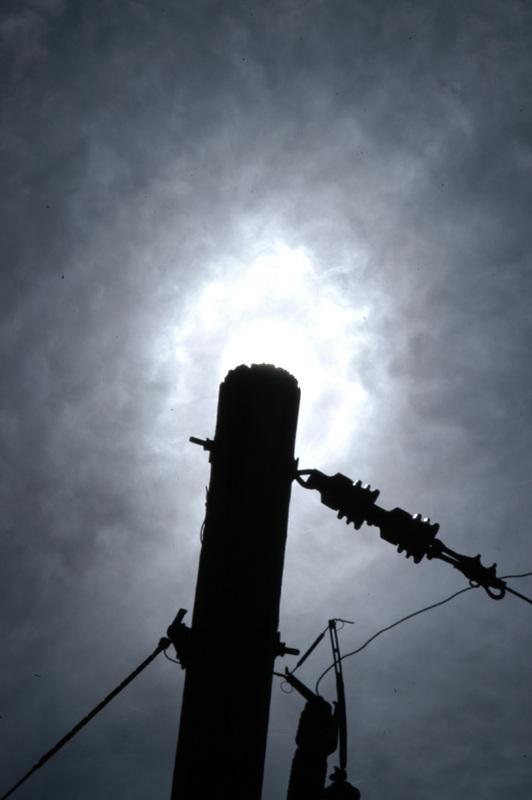 These photos may explain why sub-120° parhelion has not been captured earlier. It occurs as an isolated white spot, without subparhelic circle crossing it. Unless being exceedingly bright, it must be easily missed. 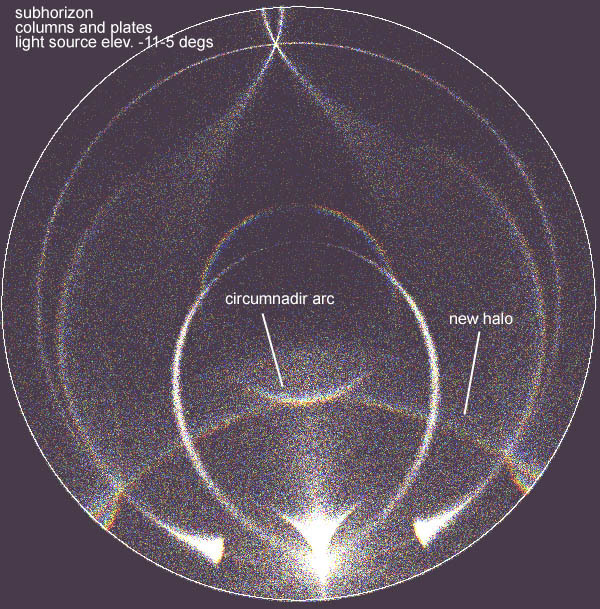 Most certainly sub-120° parhelion has occurred in all of the displays with subparhelic circle, because plates are the major contributor to subparhelic circle intensity. Subparhelic circle made solely by Parry orientation is more of a theoretical consideration, and columns do not make subparhelic circle at all. Sub-120° parhelion has been photographed once earlier in spotlight beam in diamond dust ( 2 ), but Tomas's "old school" observation is of course the true discovery. See also Les Cowley's report ( 3 ) on the case. 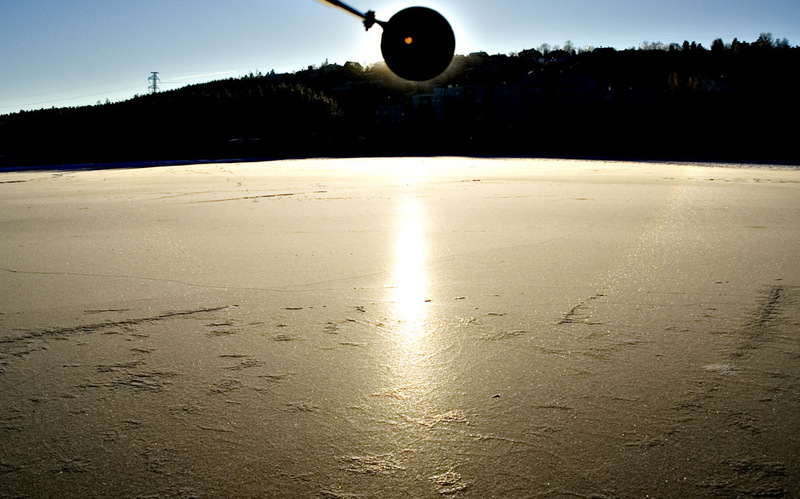 This 22° halo on ice surface was seen on 17 January in Tampere. It was more pronounced on the right side. Intensity asymmetry was not caused by local changes in crystal densities because it was seen wherever I walked on the ice. 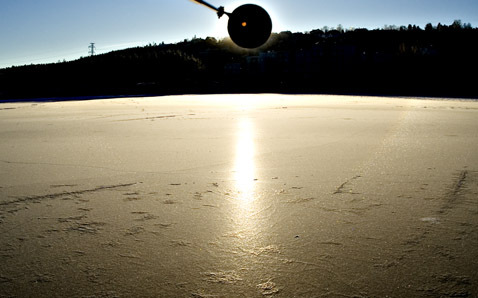 The effect must be made by atsimuthally oriented crystals on the lake ice. Possibly wind blowing from one direction had caused non-uniform deposition of moisture, resulting in (poorly) atsimuthally locked crystals. 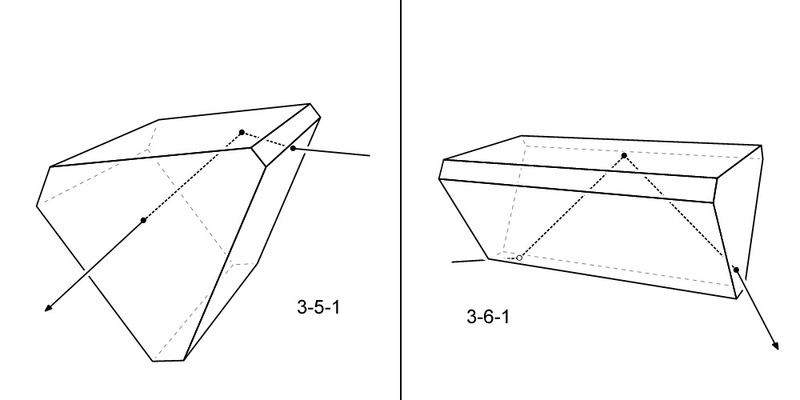 This is not the first time when asymmetry of halos on ice surface has been noticed. 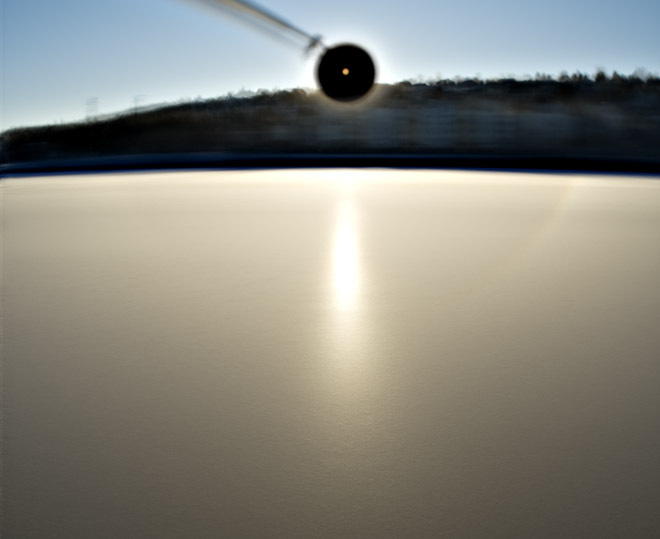 In December 2007 Jari Piikki photographed curiously inclined halos in Juva ( 3 ).